The American Eagle All Green Protect uses a next scale stop media bed, with charcoal for chloramines and chemical reduction. ZERO WASTE, NO ELECTRICITY, NO DRAIN, NO PROGRAMMING! Media Life is 3-6 years. • A Black or Almond fiberglass filament center tank, which surrounds a heavy plastic blow-molded inner tank. • Activated Carbon is used to remove impurities, including organic contaminants, chlorine, chloramines, pesticides, color, taste, odor, and much more. • Great tasting water at every tap, no slippery feeling. Most home water conditioners use only a second-stage softening mineral in their filtration process, but Radiant Water sets its standards higher. 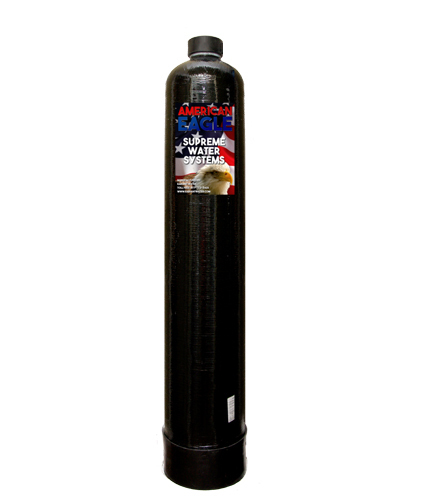 American Eagle All Green Protect Water systems have up to 6-stages of filtration which consists of Catalytic Carbon, Coconut Carbon, KDF 55, Silica, Quartz, and TAC Scale Control. Along with a pre-sediment filter.